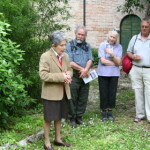 In September 2013 the Escape Lines Memorial Society, in conjunction with the Monte San Martino Trust, organised a trail event in the Marche region in north east Italy. 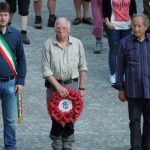 The event was to commemorate the 70th anniversary of the Italian armistice, and to visit an area where many allied POWs had been sheltered by the Italian population. There were two POW camps located in the area of the trail, Camp 59 at Servigliano, and Camp 70 at Monte Urano. Camp 59 held about 3000 POWs, Camp 70 about 8000. On the 8th September 1943, the Italian government surrendered and as a result many of the camp guards at POW camps simply walked away and left the inmates to their own devices. Many POWs just walked out of their camps and hid in the local countryside. However, finding food and shelter proved to be a significant problem, and most of the escapers were forced to seek help from the local Italian population. Despite the dangers to themselves and their families, many Italians took in the escapers and provided food and shelter for a considerable period of time. Efforts were made by Allied military organisations to collect and evacuate escapers and a number were taken by ship/submarine to safety in the south. However many escapers stayed in the area, either working as farm labourers or in some cases joining up with groups of local partisans. These servicemen would eventually be ‘picked up’ as the Allied advance pushed slowly northwards. There can be little doubt that many of our fathers would not have survived had it not been for the bravery and humanity of local Italian people, and we owe their descendents a huge debt for what they did. The principal aim of this event was to show the local population that we have not forgotten what their forebears did for us. All those participating made their way, by a variety of means, to the small town of Servigliano in the Marche, arriving on the 4th September. Events got under way that evening with a reception hosted by the local Mayor at the newly opened museum to the history of Camp 59 in Servigliano. The establishment of the Museum is largely the work of Guiseppe Millozzi, son of the MSMT’s administrator in Italy, Antonio, and all credit to him for a fine job. The museum was the former railway station where all POWs would have arrived, and is located across the road from the original camp. All that remains of the camp today is the camp wall, the former buildings and huts have all been demolished and the site has become an activity park, used for sports and other cultural events. The Museum holds a good collection of photos and other audio/visual exhibits recounting the history of the camp, which had been set up during WW1 as a camp for Austro-Hungarian POWs. During the inter-war period the camp had been used by the military for a variety of purposes and then re-opened as a POW camp in WW2. Following the departure of the Allied POWs in 1943 the Germans used it as a concentration camp for people due to be deported either to concentration camps or work camps in Germany and Poland. After the war ended the camp was used to house displaced persons, and finally closed in 1955.The Mayor of Servigliano welcomed everybody and explained how pleased they were to be hosting the group, and the Chairman of the MSMT and President of ELMS replied thanking the town for their participation. After a short film recounting the history of the site, Guiseppe took the group on a short tour of the camp and pointed out the repaired section of the wall through which Keith Kilby and others had escaped. The formalities over the group then dispersed around the town to enjoy an evening meal in one of the many restaurants. On a hot and sunny Thursday morning the group assembled in the beautiful town square of Servigliano, and at a brief ceremony wreaths were laid a at the town’s war memorial. We were joined by a number of local Italians, and British ‘expats’ who had homes in the area They had either seen the posters advertising the event, or had an interest in this aspect of Italian history. Their participation was a significant bonus, as all were able to contribute to the explanation of events of the time, either from their own family’s involvement or from their research. We then set off for our first days walk, which was to take us to the small hilltop village of Monte San Martino. As we soon discovered most of the villages we were to visit were on the top of hills! Monte San Martino is of particular significance to Keith Kilby, the founder of the MSMT, who was given food and shelter by the parents of Antonio Millozzi, who lived near the village during the war. Antonio has been closely involved with the MSMT since its inception, and has recently been awarded the MBE for his efforts. The walk was led by Antonio’s son, Guiseppe, who has also had a long connection with MSMT. Guiseppe speaks excellent English and as we followed a route which included several farms where POWs had been hidden, he was able to explain what life was like for local people at the time. At the farm owned by Marino and Paola Marchese the family provided us with some very welcome drinks and delicious snacks of local ham and cheeses. Our route took us through a mixture of fields with sunflowers and open woodland, and every opening through the trees seemed to provide yet another wonderful vista of honey coloured villages perched on top of small, or not so small hills! It really was quite stunning and difficult to equate with the events we were recounting. Fortunately most of the area seemed to have escaped the devastation wrought by the fighting as the Allies advanced up the Italian peninsula, and many of these towns and villages have survived unscathed, along with their treasures. 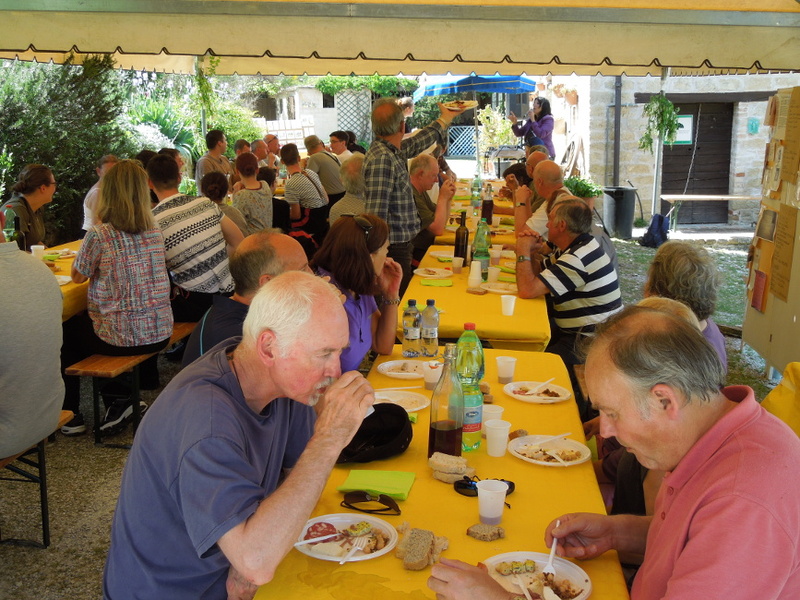 Following a pleasant walk through the lowlands, and a rather more arduous uphill climb we arrived at the village to be met by the Mayor and treated to a very welcome lunch. Monte San Martino, like many of the towns and villages in the area is quite beautiful, with a long history. Refreshed after our lunch, the group laid wreaths at the village war memorial, and then wound their way back to Servigliano, with Guiseppe continuing to provide a wealth of fascinating facts about life in the Marche for both POWs and the local population. On the final leg we stopped to listen to a delightful lady wandering about her farmyard in her socks! Dina was a child during the war and she recalled clearly the fear she experienced as the Germans retreated through the area in 1944. She explained that troops were often drunk, and were casually brutal with anyone they suspected of siding with the Allies. On our return to Servigliano the group then dispersed to their hotels/B&Bs to sample the excellent local food and wine on offer! Another hot and sunny day saw the group assemble outside the gates of the old Camp 59 prior to setting off to visit Montelparo and Monteleone. Our guide was Ian McCarthy, an Englishman who has lived and worked in the area since 1982. Ian had acted as a link for us during the planning of the trail and there is no doubt that without him the trail would not have been the success that it was. The hot weather proved something of a trial for the walkers, and we were very grateful to the back up team of Steve Simms and Charles Perry, who dispensed water and other goodies from the back of their hire car. Because of the hot weather we took regular drinks breaks and during those halts Ian used an account provided by a US serviceman who had joined a partisan group, to illustrate what life had been like for him for almost a year! We stopped mid morning at the home of Pancrazio Tulli and Margret Cornelius in a small hamlet. Delicious slices of cool melon, washed down with iced tea or red wine refreshed the group as we learnt that some years earlier Pancrazio’s son and nephew had been recipients of an MSMT bursary to study english in the UK. We also heard that his grandparents had hidden two escapers in the village of Smerillo. His mother had told him that they were found by the Germans in their cave and taken away. She had always been sorry that she had been afraid to look them in the eye as they went for fear that the Germans would take her too! We arrived finally at the village of Montelparo and took lunch in the very splendid surroundings of the town hall council chamber. After lunch a small group were taken to a spot just outside the village where a young British POW, on the run, had been shot and killed by the Germans, who spotted him one day. The location was marked by a simple iron cross on the verge, in some danger of falling down the steep slope as the soil eroded. There was some discussion among those present as to how the memorial might be made more permanent to ensure future visits would still be able to find it. During our return we passed through the village of Monteleone, where we laid a wreath and listened to a quite emotional speech by a town councillor, who talked about the sad history for all involved in events of that time. Our final meeting of the day was with a 90 year old survivor of the times in the Marche, Guerrino Balacco, the relative of one of our Italian friends. His story focused on the vicious factional fighting between fascists and Partisans, an aspect of the history of the Italian campaign that is often overlooked. When we finally returned to Servigliano It was a pretty tired group that dispersed from Camp 59 that evening We also had to bid farewell to a number of the members of the MSMT who were leaving the next morning to travel to Fontanellato, another POW camp situated near Parma, for a commemorative lunch. The camp had housed officers, including Sir Nicholas Young’s father who escaped to make it through to the Allied lines near Anzio! 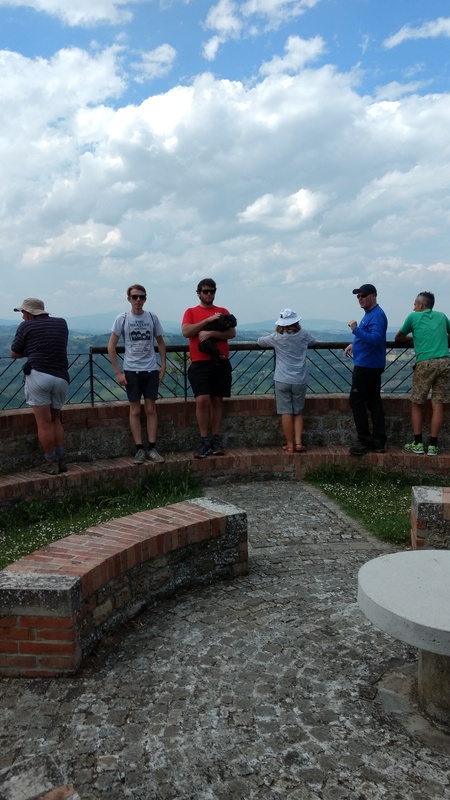 As the fine weather continued Saturday saw the smaller group prepare for the final long haul to Smerillo, via San Vittoria in Matenano, and Montefalcone in Appenino. Our guide for the first part of the day was signor Paolo Le Spada, a professor of History, who during our breaks recounted what life had been like for local Italians, as they lived under the threat of execution for harbouring POWs. Our mid morning break was taken at the B & B used by several in the group and run by Luigi and his wife, the Garten Hotel. Rrefreshed with fruit, cakes and ample drinks we headed on to San Vittoria. We arrived, very hot and tired at about midday, and following a simple wreath laying ceremony at the town’s war memorial we took lunch in the shady grounds of the Collegiate church. Ian McCarthy resumed his duties as guide and after lunch we set off again, and faced a steep climb up to the town of Montefalcone, using an old donkey trail which had been the original route into the town! Once at the top we were refreshed by the offer of cold drinks at one of the local cafes (we subsequently discovered it was courtesy of Anne Copley) before completing the final leg of a long day to the small village of Smerillo. We arrived in time for an evening meal in a local restaurant, which was perched on the edge of the town, with the most wonderful views over the surrounding countryside. Here we met Guiseppe Millozzi and some of his friends, and all sat down to a truly wonderful meal of local Marche dishes, washed down with plenty of very good wine. Dinner was followed by some blues music played by a guitarist of some note. This seemed to encourage some of the assembled gathering to get up and undertake what might loosely be described as dancing! Video and photos of both the Chairman and Treasurer are available on request! Bidding farewell to our delightful hosts we enjoyed the comfort of a coach ride back to Servigliano and a nightcap before turning in. 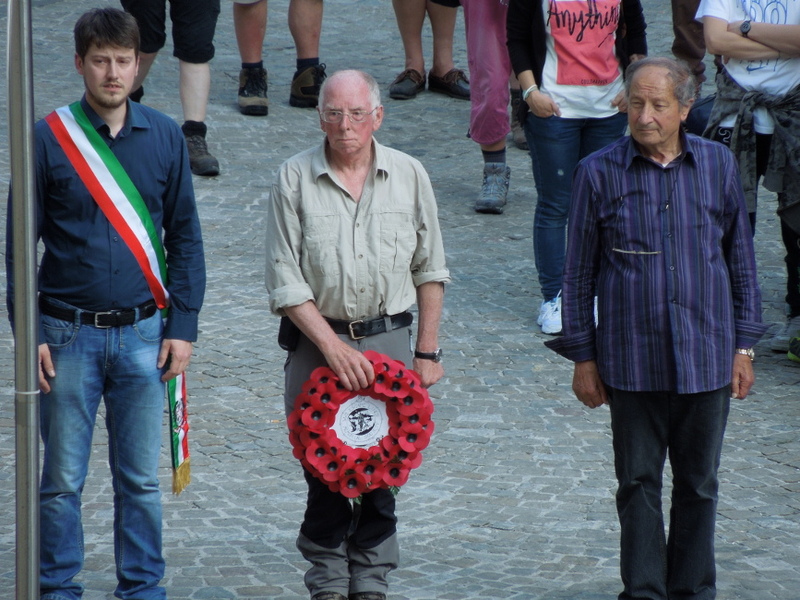 The programme for the 8th September was focused entirely on commemorating the anniversary of the Italian Armistice. The group boarded the coach for the short drive to Fermo, and we arrived at the gates of the former Camp 70 at about 10.00am. Here we met a crowd of local people, representatives of various Partisan groups and also members of the local councils. The Camp, a former leather producing factory had in fact shut down, and we were grateful to the owners for allowing us access to the site. The local Mayor of Monte Urano welcomed everyone and reminded us all of the part played during the war by local people, after the 8th of September 1943. Ken de Souza, a former POW in the camp, had returned to the area after the war, and had maintained close links with the family who sheltered him. 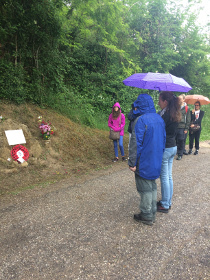 His son, Ian, had joined the trail and took centre stage for the day’s events as we visited first the camp, then moved onto the house of the Brugnoni family who had sheltered him. The local community have erected a memorial to Ken de Souza in a nearby park, and we gathered at the memorial for a short ceremony, before enjoying a very good picnic lunch provided by the present Brugnoni family prior moving onto our final visit to the Villa Salvadore. The Villa had been used as a concentration area for escapers prior to them being taken out to a waiting vessel and then onto to the safety of the Allied lines. A descendent of the family, Clara welcomed the group and explained in excellent English what had happened at the Villa, and following some refreshments the group boarded the coach and headed back to our base in Servigliano. That evening the whole group and friends enjoyed an excellent final meal at the San Marco, before saying our farewells. The whole event had been a tremendous success. I particularly enjoyed the opportunity of making new friends, and to talking to Italians who could provide an insight into what had happened there in 1943-44. We had enjoyed fine weather (perhaps even too fine! ), made some excellent contacts and been welcomed wherever we went. We hope that we have sowed the seeds for something that will endure for years to come. The group arrived from the far flung corners of the world, by air, rail and road; from the UK, Australia, the Veneto and Sicily. A smaller group than originally booked (the Trail coincided with the Election and VE Day celebrations), but an enthusiastic group nevertheless. A few familiar faces returning from last year and others for the first time. Myles, Charles, Roger, Boris, the Haughie’s, the Stewart’s, Brian Lett with Gus, Gillian, Eleanor, Anne, David, Rob and Steffi to be joined by locals Ian, Giuseppe, Paolo and others. We received a very warm welcome from Alessia and the staff at the San Marco Hotel in Servigliano (which has undergone a major refit, with work in progress). 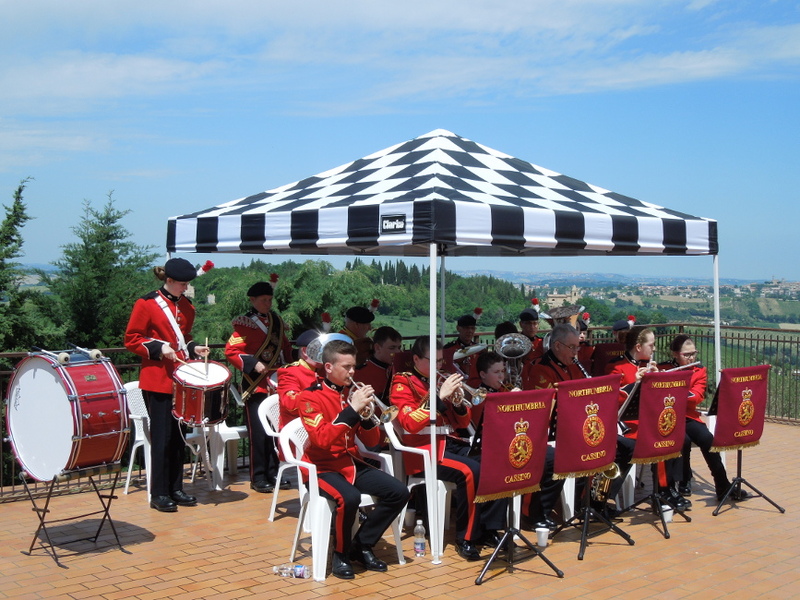 On the Wednesday evening the party assembled at the Casa Della Memoria Museum [the town’s old railway station adjacent to PG 59] with a musical greeting from the Northumbria Army Cadet Force ‘Cassino’ Band who were on a supporting concert tour of the area. To the delight of the assembled overseas visitors one of the numbers played was the theme tune from the film ‘TheGreat Escape’. The Band proved to be a popular attraction and soon drew a crowd of local people. 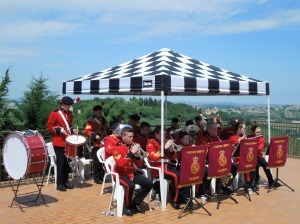 Following the band concert, members, guests and casual visitors retired to the museum where, after welcome speeches, Giuseppe Milozzi and Ian McCarthy introduced local people whose families had hidden escapers in the area during the latter stages of 1943 and 1944 and we listened to their stories. We finished off the evening with an excellent dinner at the San Marco, washed down with several bottles of local wine. The weather when we arrived was very warm, sunny and dry, the local temperature recorded 31C during the afternoon. Everything was set fair for the walk. Thursday morning dawned with a cool breeze and rising temperatures. 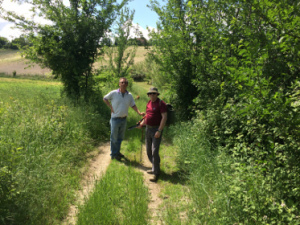 We formed up at the Camp entrance and began our walk to Monte San Martino. Unfortunately, the flow rate of the Tenna River was too fast for safe crossing (as I subsequently discovered! ), so the road route was the only option for the first part of the walk. It is little things like that, that remind us that those who had sought freedom during WW2 had to cross obstacles regardless of the state of the obstacle, or the weather, or their own physical condition. The group stopped short of the village to have lunch as guests of the Barcetta family whose daughter, Lucia, had being the recipient of a bursary from the Monte San Martino Trust. We were entertained by the family with food, wine and music and it was mid-afternoon beforte we reached the square of Monte San Martino. There in a simple ceremony a wreath was laid on the War Memorial by the Mayor and Roger Stanton, ELMS DIrector. The Cassino band gave another excellent concert in the town with Sgt Brian Hindmarsh giving a first class rendition (as usual) of the Last Post and Reveille. Friday was again a cool start, but during the morning’s walk it warmed steadily. The route took a via a so called ‘white road’, (a gravelled track off main roads) past the Olive Press and strawberry fields heading ever higher towards Montappone and Massa Fermana. The story of the day was of Ray Ellis and his contempories who had been hidden locally. During the break at Montappone a local family renewed their connection with escapers, sharing the book of memories sent to them by local helpers. Saturday followed a familiar pattern and we set off at about 8.30am from the Camp gates and headed towards Montelparo via white roads, shady woods and a very steep incline to arrive in the village for lunch in the undercroft of the old abbey. The group had grown in number on the way with the addition of local residents and the remainder of the Hill family from Australia [David was walking for all the family]. 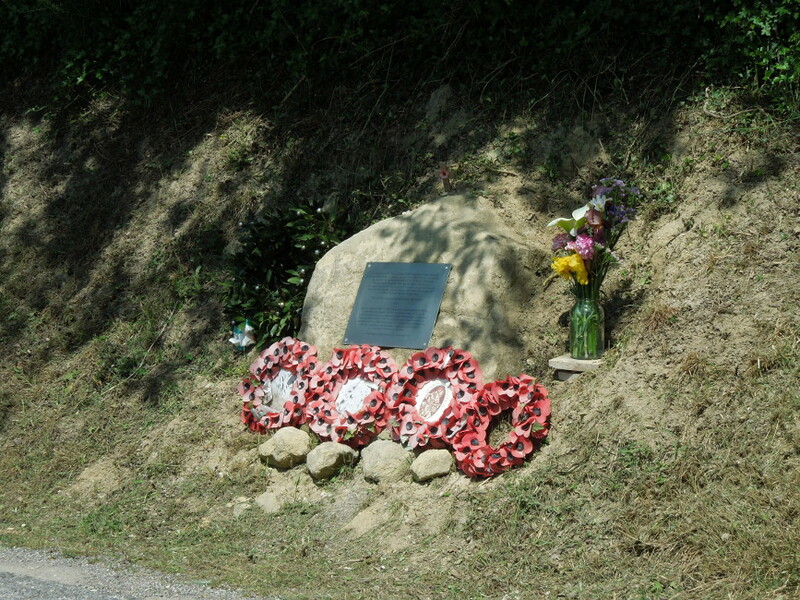 After the telling of the family’s story and the connection with Sidney Smith, the Royal Signals soldier executed by the SS near the town, the group made its way to Sidney’s memorial for a wreath laying. An ELMS wreath was laid by Roger together with Valeriano Ghezzi, the Mayor and Christina Franca, who with her family had been placing flowers on Smith’s memorial for over seventy years. We returned by road via various properties of ‘escaper’ significance and visited other families who had hidden escapers. The final day, Sunday was a day for memorial visits, meeting families who had assisted escapers and wreath-laying. A change to the programme this year was a visit to Offida where, at the town hall, Prof Rainieri delivered a simple lecture on the ‘Rat-Line’ (usually the chain of safe house/locations through which escapers were moved on their way to freedom). 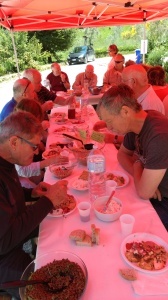 Following the informative lecture the group moved onto the Villa Stipa for lunch provided by the local Partisan/Escape Line veterans Association. 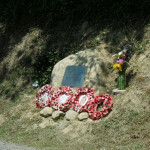 An ELMS wreath was laid on the Partisan/Resistance Memorial at the villa. The villa had been the beginning of the Rat Line heading south where a number of escapers had been hidden. Following an excellent lunch the group moved onto a very familiar location, the Villa Salvadori, another safe house, quite close to the sea, which had hidden numerous escapers over a long period of time. The present owner, Clara Muzzarelli Formentini had invited a number of other safe-house families to the villa, and provided food and drinks for everyone. 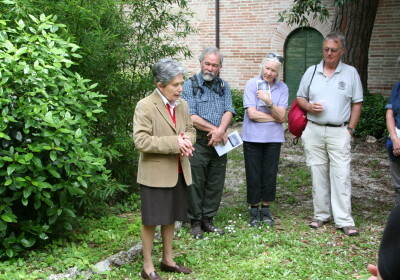 She also gave the visitors a short talk on the villa and its involvement with escapers during WW2. Our last port of call on Sunday afternoon was to visit the site of the former POW camp, PG 70 at Monte Urano. Most of the original buildings are still standing and at its peak he camp had held over 8000 POWs. Following the declaration of the armistice on the 8th September 1943 the POWs were ordered to remain in camp by their SBO. This was to prove to be a catastrophe for the majority, who were quickly transported to other POW camps in Germany and elsewhere. Some did escape and there is a report elsewhere on the website of one such story. After a long and tiring day the party returned to Servigliano and enjoyed a superb farewell dinner at the San Marco Hotel. 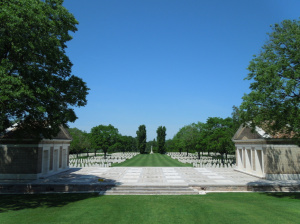 On the route back to the UK the Support Crew visited the Commonwealth War Graves Cemetary at Rimini and laid an ELMS wreath on Sydney Smith’s Grave. A small but select group travelled to Servigliano for this year’s trail event. Held against the backdrop of the recent earthquakes we were initially uncertain that the event would go ahead,. but the local communities were insistent that they were ‘open for business’. This despite the fact that a number of villages had suffered grievous damage and were effectively closed, even to their occupants. We all met on the Wednesday evening at the museum in Servigliano where we were welcomed by the Mayor followed by a short film made by Guiseppe Milozzi about a group of allied airmen who had been cared for by the inhabitants of a small hamlet high in the mountains. Guiseppe had managed to track down the son of one of the escapers who then returned to the village to meet some of those who were children when his father had been there. During his interview one of the older women asked the question “Why did no one ever come back?” A question I suspect that many have asked. Well ELMS is doing its best to try and put that omission right by supporting a growing interest among young Italians keen to know just what their forebears did do! Thursday dawned bright and hot and after the usual wreath laying ceremony in the centre of Servigliano the party set off for Monte San Martino. 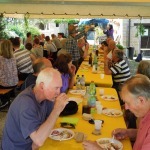 There was one planned stop along the way at the farmhouse of a local family family where the group were royally entertained to a delicious meal of locally produced vegetarian food. Some time later they managed to stagger their way up the hill and into the main square of Monte San Martino where we laid a wreath at their memorial! The format of the trail has been changed and after the wreath laying ceremony the group returned by bus to Servigliano. That evening we attended a presentation given by one of the local people whose family had been involved in sheltering allied POWs on the run. His simple but moving description reminded all those present just what the Italian population had risked for people who had until very recently been their enemies! Friday was another hot day and the group headed for Penna San Giovanni, not far as the crow flies but as the photo shows quite a climb. During breaks on the way Ian Macarthy, our local ELMS rep quoted excerpts from a ‘diary’ written by a US evader who had eventually joined a group or partisans. 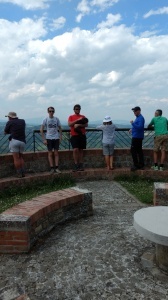 Lunch was taken at the top after which everyone returned to Servigliano and was able to enjoy an evening meal either at the hotel or one of the restaurants in town. For those interested in Italian food this was an opportunity to enjoy some excellent local cuisine and wine and we certainly did our bit to support the local economy! Saturday was overcast and threatened rain at some time. We were joined for the day by a group of Italian students from the high school in Fermo and the day began with a presentation in the Museum after which the group set of towards Montelparo and surrounding villages. The threatened rain arrived in torrents and a very wet and bedraggled group finally arrived at their lunch stop having walked through a quite alarming thunderstorm. However spirits were high by those that persevered as their and our forebears would have done many years ago. There was a short wreath laying ceremony at the monument to Sidney Smith and after lunch the group returned to Servigliano. Sunday is a day of scheduled visits and after further presentations at the Museum the party set of in the Direction of Fermo, to visit the area of Ken de Souza’s escape and Camp 70. 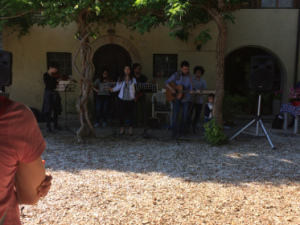 The party then moved onto the Villa Salvadore and were hosted by the delightful Clara and the group were royally entertained with food and music. The group returned to Servigliano and enjoyed a farewell dinner in the Hotel San Marco, before an early start for home on Monday. This year was another successful visit to a country where all to often we forget the part played by the local population in helping many of our ancestors. As our visit followed after the devastating earthquakes we also took with us a number of small hampers, containing typically English good which our Director distributed amongst families who had been identified as playing a part in helping Allied POWs. The Tenna trail has become a firm fixture in the Trail calendar and we look forward to returning next year.